The 2015 climb is moving upward and onward day by day. Here is a view of the entire year of 2015 as of February 17th. I have been enjoying the journey! here is a detail of the middle with my leaning heart for Valentines Day. I have also been doing a little finishing work on the 2014 daily tapestry and here you can see the backing is being attached. 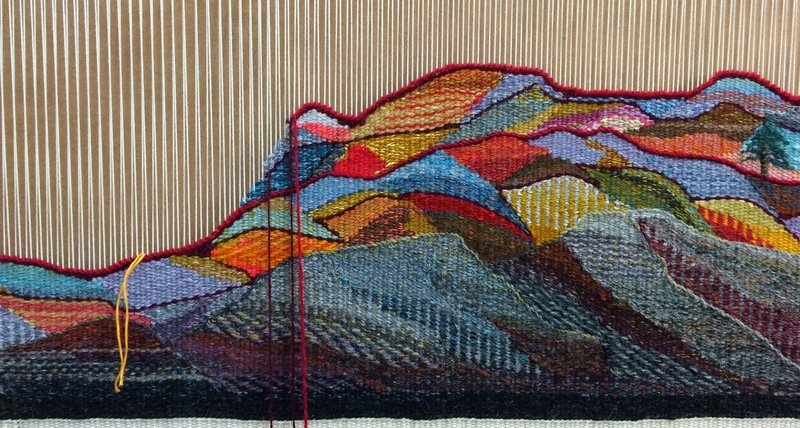 It will not be much longer and this one will be ready to photograph as a finished tapestry! Finally here is the progress with Hands On as of the end of today (Feb 17). I don't really know if iI can finish by the end of the month but I think I will keep pretending that I can and see what happens. Progress is being made. The Ymmyarns order has been shipped and should be arriving soon so if you have been waiting for color cards it should not be long now. If you would like color cards for these yarns now would be a good time to let me know and I will get them out to you as soon as the shipment arrives. 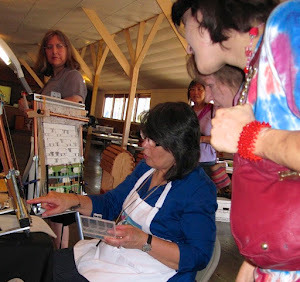 I am still trying to get my older projects finished up before the new loom arrives and giving some thought to drawing the cartoon for the Paintbox tapestry but no action yet on that job. It is tempting to start it," but the finishing comes first", she said with determination. 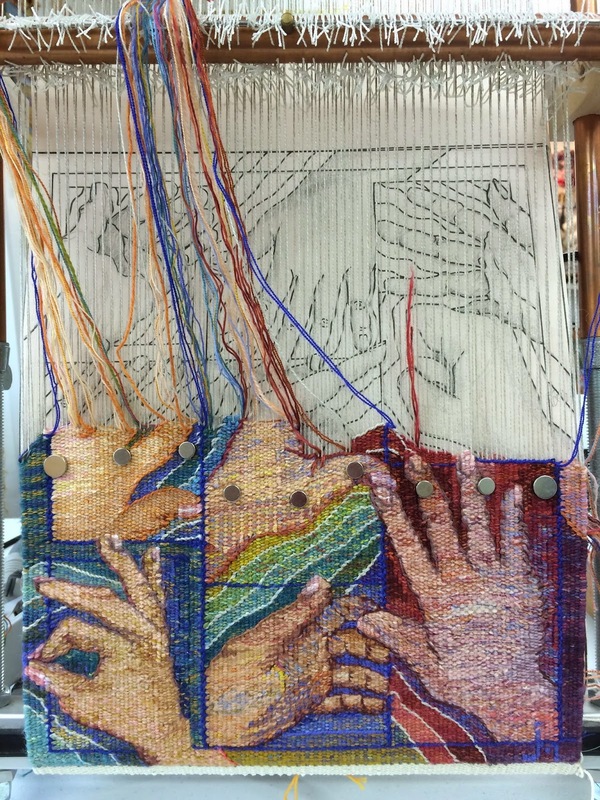 on the 2015 tapestry diary project, the finishing of 2014 and weaving my Hands On tapestry but it does seem like time is moving faster than I do these days. 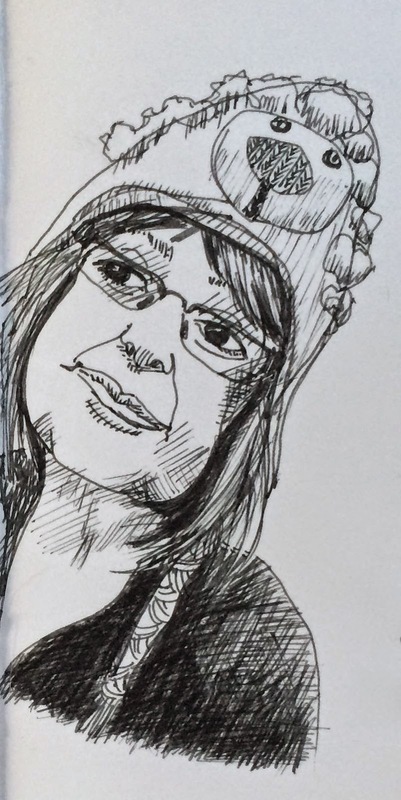 I have the motivation of a new loom that will be arriving soon and a new shipment of Ymmyarns to spur me along through the finishing of the 2014 daily weaving tapestry and the weaving of the hands. Both have made some progress. 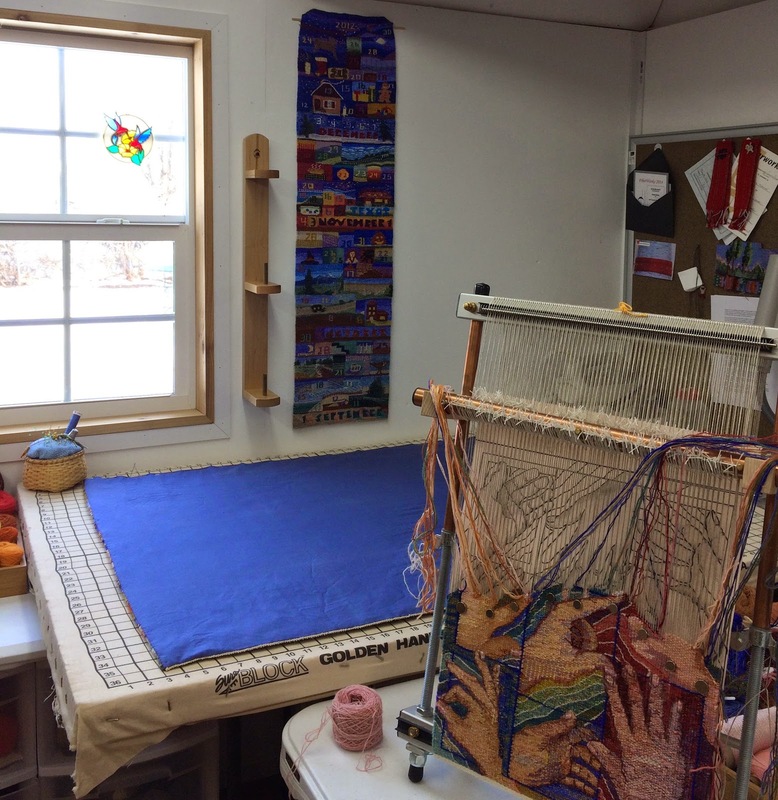 Here is a photo of the whole 2015 daily tapestry project after the entry on February first. I am now climbing back across and further upward. This updated photo taken this morning shows the right half through February 4th. I have been enjoying just working with the shapes and colors and thinking about what new things I might want to try. 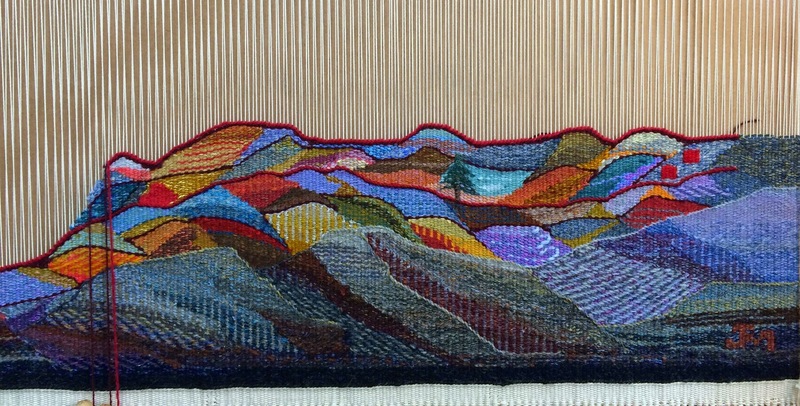 Here is a photo of the middle of the tapestry that I like. As I go along I think about creating an interesting edge for the next month to climb from. This view shows the far left with the beginning of January. It was an unusual January for us with temps ranging from a sunny 80 degrees to freezing cold with a substantial wind thrown in the mix. We have not been covered in snow as much of the country though. 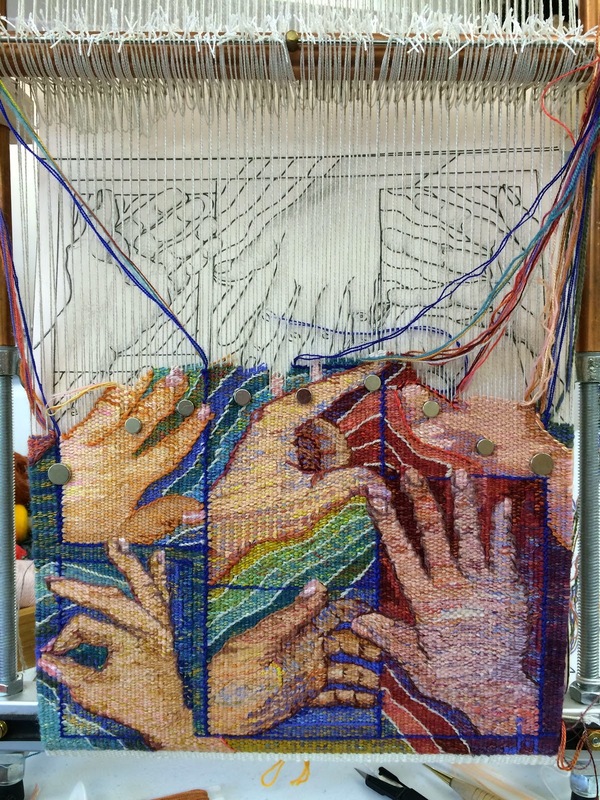 Once the 2015 tapestry diary was established and caught up I started work again on this tapestry of hands. 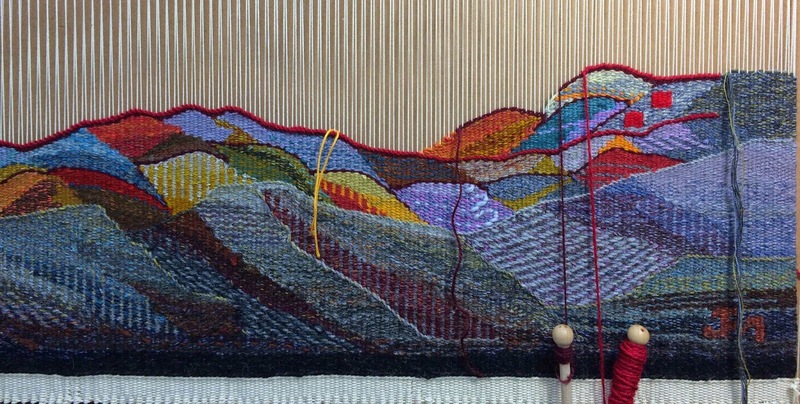 I think a plan for the rest of the tapestry has developed and I still think it might be possible to finish weaving it by the end of the month. 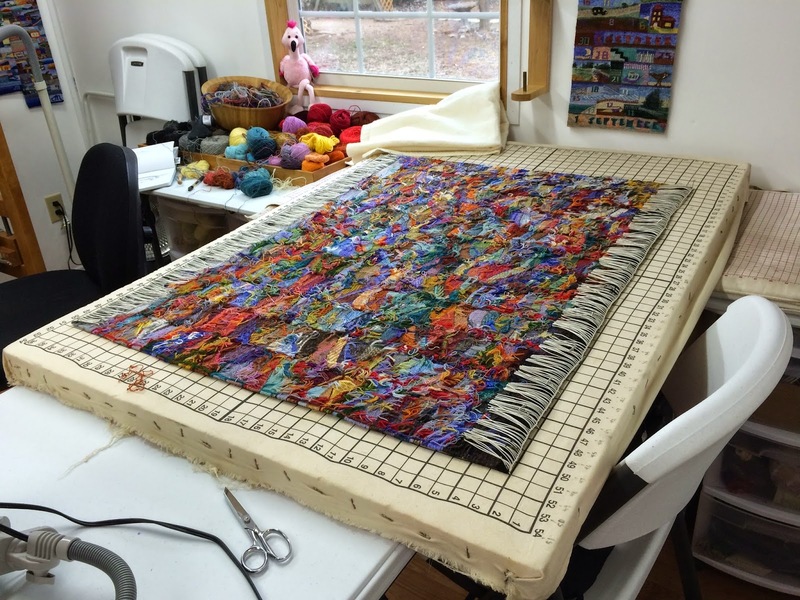 Here is a photo from this morning of the 2014 tapestry diary with the finishing in progress. It is coming along, a few more days should do it. I am waiting for the Ymmyarns and color cards to arrive this month. If you are interested or have written about the color cards I should have them soon. For now, it is back to work, lovely fibery work.